The honesty of mikefellow's music takes precedence over everything when it comes to his craft. 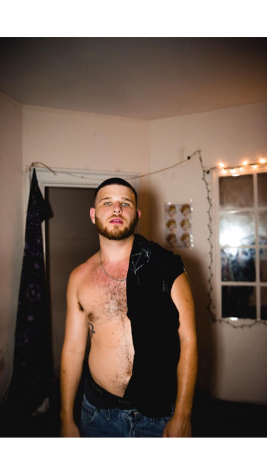 Mike Garfinkle, known to his fans as “mikefellow,” is a 21-year-old artist hailing from the Boston area, currently studying communications as a junior at the University of Massachusetts Amherst. If the essence of who he is as an artist could be captured in one word, it would be “real.” The honesty of his music takes precedence over everything when it comes to his craft. While every artist desires appreciation when it comes to their music, Garfinkle is not actively hunting down this attention with clout ploys. Instead, he is creating for a cathartic outlet and letting the music lead the way. Astghik Dion: For someone who has never heard your music, how would you describe it? Mike Garfinkle: I would describe it as pretty honest, and introspective. Most of the stuff I talk about is just s*** that I deal with, and like trying to keep it as — for lack of a better word — real as possible. Just trying to make it like, when people hear me, they hear who I am … A lot of my music is trying to work things out when I write them, and then recording them is getting it off my chest. AD: How has balancing being a musician as well as a college student affected your career as an artist? MG: I mean, to be honest, if I could go back to when I was 18, I probably would’ve taken some time off to figure out if I wanted to come. I like being in school because it’s good to learn things. I enjoy being in class, I enjoy learning. But to go from the summer when I was just going hard, making music every day, working on my project — and then to come back and have to, like, fit all that around another thing kinda feels like a drag sometimes. But I’m grateful that I’m able to get an education. I think it’s important. AD: How long ago did you start pursuing music? MG: I’ve always enjoyed music. I have three older brothers who are seven to 13 years older than me, so I listened to a lot of Tupac, Eminem, Biggie and Jay-Z when I was like three or four years old — so I was exposed to it pretty early on. I’ve always enjoyed rap and music in general. My dad has a ton of music, mostly on CDs and stuff like that, but I started writing when I was like 13 or 14, then started taking it a little more seriously when I was probably 16 or 17. But I’d say since I got to school and I’ve kinda been on my own. That’s when I really was trying to figure out what do I wanna do, and I feel like I’ve sort of landed on it. AD: Was “Hot Wings” your first project that you released? 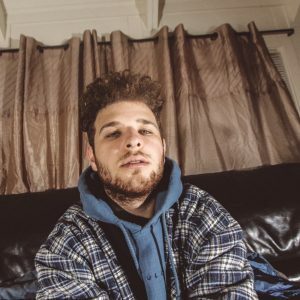 MG: No, so two summers ago I released a project called “Drift,” and it was kind of similar — like a four-song EP — and the production was with the same kid who did most of the production on “Hot Wings,” Sean Waters. That was my first real project that I put out by myself and I kind of spent time just trying to figure out where I wanted to go next. AD: How has the feedback on “Hot Wings” been? MG: I mean I would say it’s pretty good. The release party that I did the night before we put it out — people were going crazy to it. That was a really encouraging sign before I put it out. I’ve gotten mostly positive feedback; no one’s, like, hated on it. It’s doing well, and more importantly, I feel like I did what I wanted to do with it. That’s what I was aiming to do, to just do something that was authentic, so I feel good about that and I feel like that’s why people have been responding positively to it. AD: What is the song you are most proud of? MG: Probably the first one, “SOUNDWAVELIVEFOREVER.” I mean I’m proud of all the songs, but that’s probably my favorite one ‘cus to me it’s just the perfect introduction track. It just sort of encapsulates like a little bit of what you’re going to hear through the whole tape, kind of like bundled up into one. AD: Sean Waters was the main producer on “Hot Wings.” What is your relationship like with him? 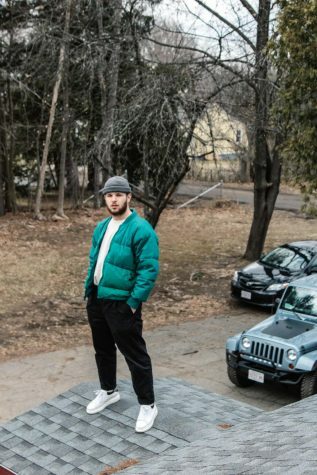 AD: YOUNGFACE is a UMass artist who was featured on the EP and also mixed the whole thing. How’d you guys meet? MG: He was like the glue. He lives out here. We met one time at a show that he was performing at early on last year out here. We didn’t hit it off right away, but then he hit me up maybe a few months later because he had heard my music and he f***ed with it. Then we put out a song called “Wake Up” that ended up doing pretty well, and from there we just kind of started talking more, working on more music, and similar to what happened with Sean Waters, me and YOUNGFACE just became super good friends. He’s really good with the mixing and the mastering, and kind of cleaning up the ideas. AD: What is the goal of your music? Is there a message you wish to outstretch through your creation? MG: Honestly, my main goal when I make music is to resolve the s*** that I’m going through, but I definitely make an effort to make it relatable. I think I’m pretty relatable, I’m just kind of a normal person. I don’t really try to put on any personas that I’m really different, other than the fact that I write about it and make music about it … but without speaking at people — I don’t like being preachy. AD: Have you encountered any insincerity, corruption or frauds within the music business — especially in recent years? MG: Yeah, I mean like nothing crazy, but there’s so many snakes, like so many fake a** people in the industry. I’ve been making music and doing shows, and talking to people that do music videos, working on features and this and that for five or six years now, so I’m sort of used to it. I know what to expect, I’m not really naive … That’s why I kind of keep to myself and do a lot of stuff with the people I’m actually friends with. Basically, all my best friends have a hand in what I do. The “SOUNDWAVELIVEFOREVER” video that is gonna come out at some point is made by one of my best friends, one of my other real good friends does all my cover arts, and we came up with the merch ideas together, but he makes the clothes. YOUNGFACE, Sean Waters — I try to keep it in-house. AD: Yeah, so it’s not about clout for you. It’s more about being genuine. MG: I mean, I think anyone would be lying if they said they truly didn’t care about getting any attention at all. But I want my attention and my clout to come off of the music. I want it to be because I’m making good s***. Not because I’m acting like I’m making good s***. AD: Is there anything else you want people to know about you, or any upcoming projects we should keep our eyes peeled for? MG: The song “En Route” on the tape, that’s going to have a music video soon. Me and YOUNGFACE got this kid to come from Miami and shoot the video ‘cus I guess he had heard it, really liked it, reached out to YOUNGFACE, and was like, “Yo I want to shoot a video for you guys.” So he came up here, we just stayed at YOUNGFACE’s crib for like four days making music, like drinking, f***ing around. And we made the “En Route” video, and then the “SOUNDWAVELIVEFOREVER” video is gonna come out after that. And then I’m just writing a ton of music, I’m always writing. Listen to “Hot Wings” here, check out the video for “Wakeup” below, and keep an eye out for what’s to come! Email Astghik Dion at [email protected], or follow her on Twitter @as_tghik.